Welcome to Deer Point Paradise! You're finally here and the views are spectacular from all angles. This beautiful private beach is the perfect picnic and sunbathing location! The view from the beach looking southeast. A bright living room welcomes you to stay, relax, and rest your feet. The dining area looks over the waterfront and the deck outside is immediately accessible. The kitchen is modern and well equipped with a nice seating area included to bring the conversation in! The spectacular deck location provides an unbelievable setting for meals. Whether it's breakfast, lunch or dinner you choose to have outside, you've never experienced a meal like this one. Enjoy a tastefully appointed master bedroom with king bed and a beautiful mix of classic island wood colors. 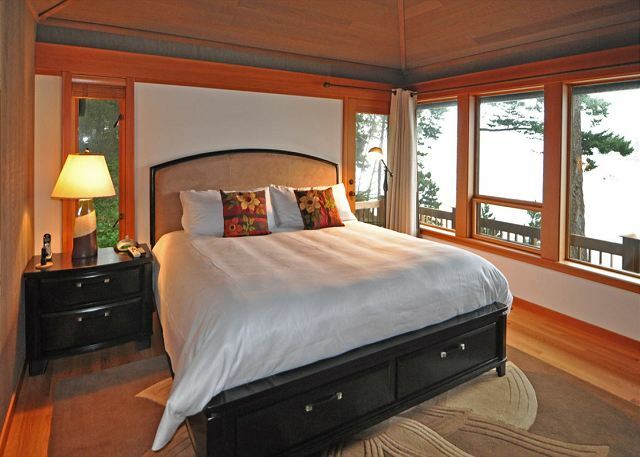 The master bedroom offers a fireplace, TV, and deck access (and a view of the water, of course)! 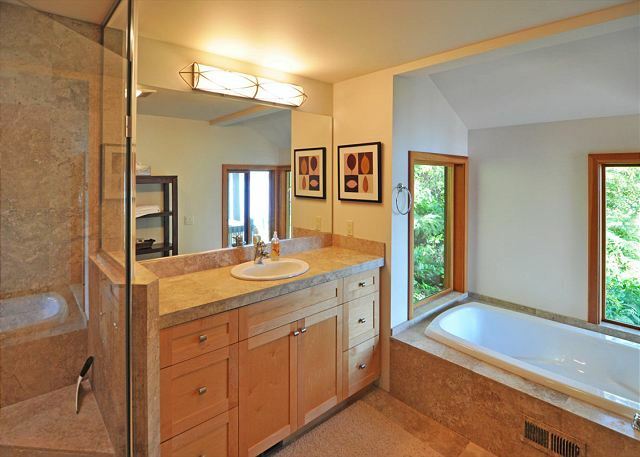 The master bath features stone surrounds and a deep soaking tub. 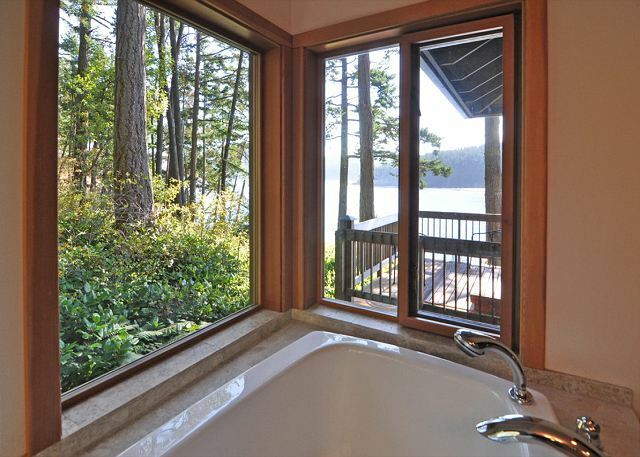 The soaking tub in the master bath is extra deep and comes with a view as well. Guest room with king bed. Queen bed with stairway to open loft with two additional twin beds. Loft with two twin beds. Views from the deck look out over Rosario Strait, Obstruction Island, and Cypress Island. Wow. Have we arrived yet? Yes we have. 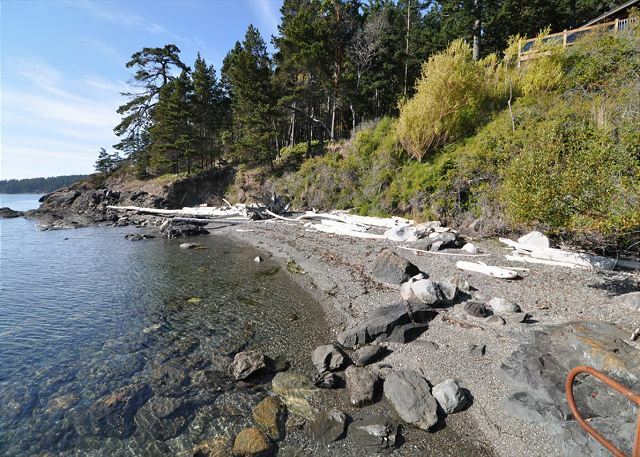 EXCEPTIONAL ORCAS ISLAND VACATION RENTAL WITH PRIVATE BEACH! 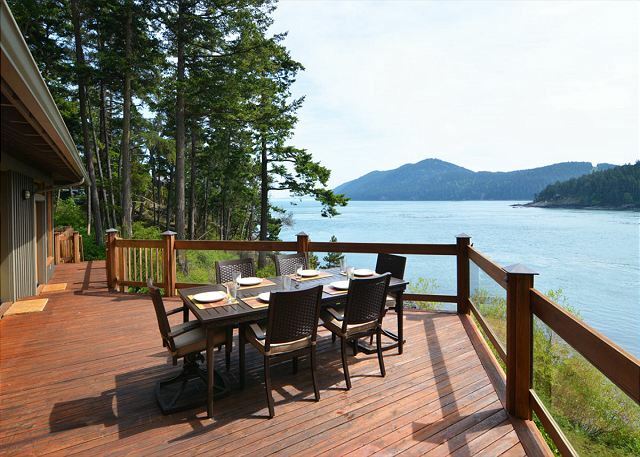 Envision your dream Orcas Island vacation home and you’re likely imagining Deer Point Paradise! Homes of this caliber are rarely offered for vacation rental. 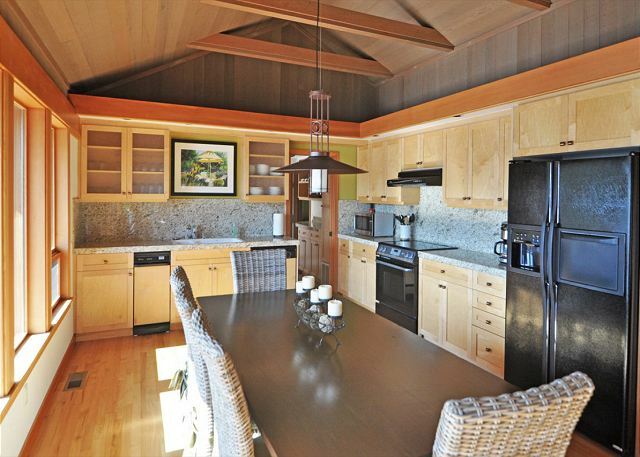 Located in one of the most desirable enclaves on Orcas Island, you will find this heavenly property at the end of a wooded lane, nestled into a sunny acre with southern exposure, and facing the sparkling sea. One’s own accessible waterfront is always desired in a dream vacation home but rarely found, making the fantastic private beach on the property a cherished commodity. A gentle path leads from the home to the secluded crescent of sand, rock, and drift where you can enjoy private picnics or simply retreat and be soothed by the restoring elements of sun and sea. The home is the epitome of the Pacific Northwest Island style, blending into the landscape with understated sophistication. The rooms ramble along the bluff to allow a view of the sea through every primary window. 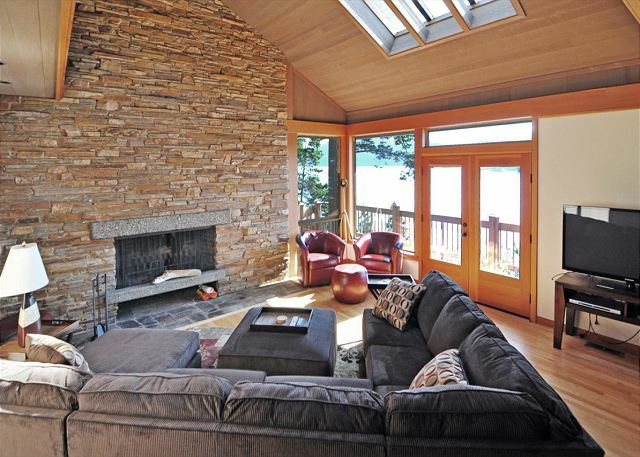 Interiors are clad in wood, skylights draw in the light, and the living room enjoys a beautiful view of passing boats. The fixtures and surfaces are upscale and furnishings are stylish and new throughout the home. Offering 3 bedrooms and a loft, each with their own en-suite bathroom, Deer Point Paradise appeals to a broad range of vacation guests. The larger of the master bedrooms features a fireplace, king-sized bed, deck access, TV, and in the marble-clad bathroom, a very deep soaking tub with a view. A second master bedroom is at the opposite end of the home, also furnished with a king-size bed, en-suite bath with shower, and deck access. The third bedroom offers yet another en-suite bath with a shower, queen size bed and deck access. 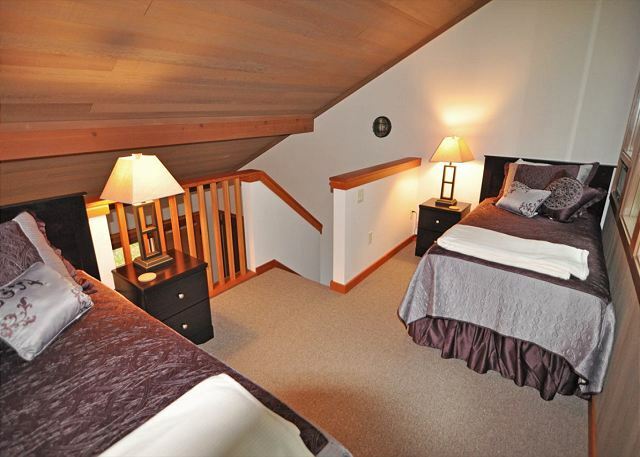 This bedroom also contains a stairway that leads up to a private loft with two twin beds. This is the perfect layout for multiple couples as well as extended adult families or those desiring a suite designated for children and their parents. The gathering spaces are open, cozy, and comfortable. The kitchen is generously equipped and the great room offers sectional seating where the group may comfortably converse, or watch television. A large deck runs the full length of the home, facing the water, where you may BBQ and dine al fresco. The coveted waterfront location, privacy, and creature comforts offered by Deer Point Paradise are truly exceptional, and will be appreciated by the most discriminating guests. Please note that an additional $50 per person per night will apply for guests # 7, 8, or 9. The home is located between Olga and Doe Bay, about 40 minutes drive from the ferry landing, and a 25 minute drive from Eastsound. Please note that owner asks that the fireplace not be used. Sometimes smokes and sets off fire alarms. Overall, very positive. Beautiful home and beautiful views, but in a remote location 20 minutes from town. Claim that home sleeps eight could be misleading because two of the beds are in a loft directly over a bedroom and all share a bath - only appropriate for children sharing with parents. We would have appreciated more towels and salt and pepper shakers. Otherwise the home is very well equipped. We love the New Leaf Cafe and Roses. Gorgeous house with fabulous view. Kitchen has quality cookware and appliances. No staples though -- you will need everything from flour and sugar to olive oil. I was surprised that the sink leaked the garbage disposal was broken, basic maintenance stuff that if someone actually lived there would be upkept. fabulous view and the house was even better. we had people from other countries with us and they could not believe how wonderful the house was and the beautiful view that existed from the balcony. Our expectations were pleasantly exceeded with the large beautifully decorated spacious rooms. The view was spectacular. Our grandchildren enjoyed the beach, the water, the seals, just the whole atmosphere. The kitchen was well stocked. The washer /dryer was a convenience with young kids. We utilized the outdoor barbecue and eating area as the weather permitted. We all enjoyed this wonderful place. It was a nice break for all of us, and a perfect place for our family get-together with young kids and toddlers. Beautiful experience. we recommend to install ceiling fans or standing fans in the summer as airflow is soso in the house. Loved that soaker tub. We had a wonderful time at Deer Point Paradise! With all that Orcas Island has to offer, we found that many days we didn't want to leave the property. The location was perfect for us -- private and quiet. The deck is amazing and the private rocky shore was hours of fun for our kids. We stayed 4 nights and had a great time. Very peaceful surroundings although the home was a little farther from our wedding, at Doe Bay, than I anticipated and a bit difficult to find in the dark. I should have looked at the map closer. The house was super clean and quiet with views from all rooms. Management needed me to let the cable man in at 7:45 AM Saturday morning which was not what I had planned. The TV still did not receive the channels he was trying to gain reception on after he left so I felt it was all for nothing. The beds and bathroom were great. Very comfortable furnishings. Would definitely rent again. Nicely laid out and updated house, nestled serenely in the woods out on the tip of the island. Beautiful view of a large canal and to the waters beyond which makes it, albeit the house is a little bit of a splurge. House is stocked with pretty much everything you could need. I would recommend owner purchase a few chaises for the outside porch however as there are none and that could have added to the lounging experience. A little bit of a hike from the ferry (35+ minutes) and about 15-20 minutes from Eastsound. If solitude and views are your thing, this is a great place to start. excellent location.Almost perfect ammenities.Clean.Quiet.Best for three couples not four because of loft location.Best only for kids. I felt as though I should have planned on writing a novel!The beauty of the area and the setting are amazing. The house was very well equipped. I wish there were a few lounge chairs for the deck. Gorgeous home. One of the best private beaches in the area. Great private location. Thankfully the home was as presented online: very clean, well appointed, with everything we needed for our week on Orcas. Close to state park hiking & convenient to East Sound shopping and day whale watching/kayaking/canoeing excursions. Outer Island Excursions will deliver canoes/kayaks to park lakes! Deer are plentiful at Deer Point, harbor seals in the sound, eagles flying overhead. It was great having the family in one location to spend time together rather than hotel room vacationing. Layout of individual rooms & baths still provided plenty of privacy too. Every room has great views of the water. The name describes it: Deer Point Paradise! Secluded, quiet, pure nature - a fantastic spot to relax. The house was very comfortable and inviting - perfect for our group of 6 adults. We would have loved to have some more kitchen gadgets (we are all passionate cooks) but the essentials were there and functioning, so everything worked out. Linen and towels in abundance. Nature was on its best for us: a week of sunshine, deer looking into our windows, sea lions paddling by, and an eagle cruising over our heads. In one word: PARADISE! We had a relaxing stay at this beautiful home on Obstruction Pass. The view from the deck is gorgeous and we loved watching the wild life - especially the bald eagles which perched beside the house and the swimming deer. The house is beautifully furnished, the beds are comfortable and the kitchen is well equipped. We would not hesitate to highly recommend this rental. This is a beautiful house on a beautiful piece of land. We had a great time and it was an easy drive to Moran for hikes and swimming. The kitchen is poorly equipped - hampering our cooking tendencies and surprisingly for a high end rental there is no sound system - but these were relatively minor. Thanks for letting us know the type of equipment you found lacking. Gourmet cooks will be happy to know that the owners are providing additional kitchen items that will make cooking for a group a bit easier in the future. Wonderful location and home. Our family had a wonderful time. The home compldtely lived up to the original presentation in the rental agreement. We would have appreciated a second roll of paper towels. And, the thermostat was locked with a password that we did not have. Otherwise - wonderful! Beautiful house, beautiful views. We enjoyed the wild life. We had a great time. So happy to hear you had a great holiday. Hope to see you again soon! Great Location. Outstanding view Well appointed house. The house was clean and well maintained. The kitchen was spotless. We have rented some homes where we had to run a dishwasher as we arrived to get utensils and dishes we were willing to use. Not problem here. The cleaning staff are very good. Beautiful spot, away from town, just a few feet from the water and comfortable furniture. We bought a big batch of groceries on the island, baked several loaves of bread, then settled in for a lovely weekend. I'm bringing a bicycle next time. We rented this house at the end of October and we found it warm, comfortable, welcoming with good quality furniture and materials. There were 3 of us but the house can accommodate comfortably 3 or even 4 couples. The view is beautiful. We saw a lot of wildlife (seals, birds, eagles, deer, even a kitty). We lit a fire every evening. If I had 2 comments it would be that the internet connection at the house tends to be sluggish and that we could have used an electric kettle but we got used to both. We enjoyed having lunch in Eastsound every day (we didn't mind the drive)and we had a truly wonderful diner at the Inn at Ship Bay; I recommend it too. We had a very restful week. Orcas is a delightful place to rest. We were there for my sons wedding we had a wonderful time!! !